GREENVILLE, S.C. -- Over the course of the season, the Greenville Drive has become arguably the deepest, most interesting team in the Red Sox farm system, with several potential big leaguers both on the mound and at the plate. Over the July 4th weekend, I was able to travel down to South Carolina and take in all four games of a weekend series between the Drive and the Asheville Tourists. After finishing our run through the pitchers, today we’ll break down the most intriguing hitter on the Greenville roster. 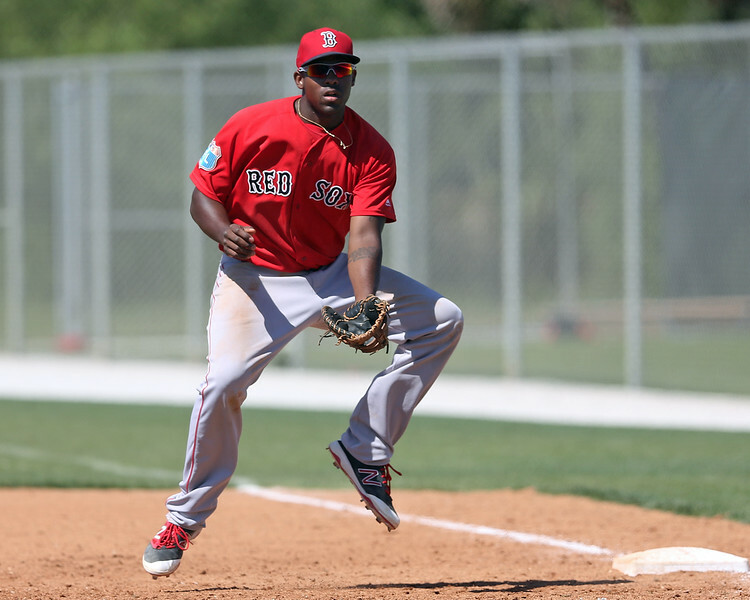 - Coming into my trip the player I was most interested to see was first baseman Josh Ockimey. After an unremarkable season with Lowell in 2015, Ockimey has put together a very impressive .271/.402/.496 line through July 12 with 13 home runs, 18 doubles, and an 18.1% walk rate. While these numbers are impressive, I was skeptical for a number of reasons. First, the South Atlantic League is hitter friendly, especially the Asheville and Greenville parks. Second, Ockimey has a first base-only defensive profile, and it is hard to buy into first base prospects unless you believe they will hit both for average and power. Based on what I saw last year in Lowell, I was not convinced that Ockimey had that in him, but the player I saw in Greenville over the four games was completely different than the guy I saw last year in Lowell. The first change for Ockimey is physical; he transformed his body during the offseason. He looks to have added significant muscle, especially in his upper body, and the added strength is showing. He no longer has the soft body that once had me concerned about projecting as he aged. He looks all of his listed 6-foot-1, 220 pounds and still might have a little more projection, as he is only 20 years old and his lower half could support some added strength. Based on reports of his work ethic and seeing him working on the field hours before the game, I think the physical changes will stick. The second change, according to reports, is that Ockimey has started and is now comfortable wearing contact lenses that have improved his vision to 20/15 according to a May article from the Boston Globe’s Alex Speier. Last year, Ockimey was very rough with his pitch recognition and strike zone judgment and had a lot of swing-and-miss in his game. That led to a far-too-high 34.1% strikeout rate and too-low 10.9% walk rate in 229 plate appearances in Lowell. For comparison, in 321 plate appearances this year, Ockimey’s strikeout rate has dropped to a manageable 25.2%, and more encouragingly, his walk rate has spiked to 18.1%. The effects of his improved vision are evident when he comes to the plate, as he is more confident with his takes and clearly is recognizing spin earlier and laying off tough pitches out of the strike zone. At the plate, Ockimey starts with a slightly open, more vertical stance than he used to employ. He utilizes a toe tap with a short stride and his hands high with short movement back and up to end in a good hitting zone. Interestingly, early in the count he sometimes used a small leg lift rather than his usual toe tap. You can see the difference in the slow motion side view in the video posted on the Sox Prospects YouTube page and embedded below. Ockimey still could stand to do a better job utilizing his lower half in his swing, but he is still quick to the ball. Ockimey has quick hands and plus bat speed. I like how his hands work at the plate and the lift in his swing path. He likes to get his hands extended, causing him some trouble with balls on the inner half. It was encouraging to see that he appears to recognize this, as he was out with Greenville Hitting Coach Lee May several hours before the game one day working on pulling his hands in and driving the ball on the inner third of the plate. Ockimey’s swing does have a little bit of hook in it, as he likes to get his hands out and looks primarily to pull the ball. Teams have clearly picked up on that, as he is one of the few hitters I have seen in the low minors have a shift employed against them, with three infielders on the right side every time he came up. Looking at his spray charts, almost all of his ground balls are to the right side, but interestingly, his fly balls have an even distribution. That the book is already out on him like that is somewhat concerning, so showing an all-fields approach and driving the ball on the outer half are two things he needs to still work on. Ockimey also will likely struggle versus left-handed pitchers given his swing and approach. In a small sample (55 plate appearances) this year, Ockimey has put together a .235/.291/.412 line against left-handers, and in the four games I watched the only time he faced a lefty he rolled over a fastball to second base. Given his keen eye, Ockimey has the profile of someone who will put up a solid on-base percentage with a decent gap between that and his average. His hit tool, however, projects to be average at best (.255-.274), with his average likely fluctuating from year to year, as getting shifted will cause him to lose a good number of potential hits. Ockimey’s standout tool at the plate is his power. Even though he is a little shorter than your prototypical power hitter, he still has plus-plus raw power. During batting practice, Ockimey showed easy pull-side power, depositing the ball well over the fence. He did flash some power the other way as well during batting practice, but in-game, he hit only weak fly balls when he worked to left field. Ockimey had one home run during the four-game look, turning on a 2-2 slider up in the zone at 79 mph. Ockimey picked up the pitch early and kept his weight and hands back, driving the ball just over the fence in left field. Long term, it is not a stretch to project him to develop plus game power, capable of hitting 20-25 home runs a year. Even with that offensive profile, Ockimey still has to show some defensive ability at first base to reach his potential. Last year in Lowell, he really struggled in the field, committing 13 errors in only 47 games, a high number at any position, let alone first. This year, Ockimey looks much better, but he is still a work in progress and has a ways to go to even project as an average defender. He is definitely putting his work in though, getting out early before the game and working with the coaching staff on all aspects of his defensive game. Even with his physical transformation, he still is a well below-average runner and does not have great foot speed. He lacks the instincts you look to see in the field, having to think over the situation when he fields the ball rather than already knowing where he is going. This was most noteworthy on two occasions. On the first, he fielded a bunt that was clearly going foul when the baserunner was already past him. This was a ball he should have known to let go, but still fielded it in fair territory, gifting the batter a hit. On another occasion, with the bases loaded and less than two outs, Ockimey was on the grass and fielded a groundball. He slightly bobbled the ball and looked at both home and second before deciding to just take the out at first base. As a result of his indecision, a run scored when it really should not have. These examples are nitpicky, but as a first baseman, those are plays he has to make. Ockimey’s hands at first base are actually alright, but he struggles somewhat to pick throws in the dirt. He did make a couple nice plays on balls in the dirt, but he also pulled his head off another, allowing it to get past him. Based on this look, he still projects as a fringe-average defender, though given the progress he has already made and work ethic he has shown, that could change. Overall, Ockimey has gone from something of a mid-range prospect with some intrigue to one of the more highly regarded position player prospects left in the low-minors and a borderline top 10 prospect in the system (which will be reflected in our next rankings update). If he reaches his ceiling, he has a chance to hit for power and enough average to hold down a job at first base or even designated hitter if his defense does not develop further. He will have to hit—and hit a lot—however, as he will always have skeptics given his defensive profile and the stigma surrounding first base prospects.